MESA, Ariz. -- This year, Chicago Cubs catcher Willson Contreras is going to let his play do the talking. Not long ago, the sometimes boisterous backstop was arguably on his way to becoming the best in the game at his position when -- very suddenly -- his development stopped. His energy never quit, but his bat and glove betrayed him as he dropped off both on offense and behind the plate. His second-half demise in 2018 mirrored his team's -- but now both are on the comeback trail. Contreras is out to prove that he is every bit the All-Star who was voted a starter just last season. "I'm going to do my work and let what you see speak for myself," Contreras said recently at Cubs camp while wearing a T-shirt with the words "DON'T BELIEVE ME JUST WATCH." "I reflected a lot about last year. I never got really down. I did my best to help, but now I need to do better." Contreras' three-year arc in the big leagues tells a story of regression. For some, it makes little sense. Others see his emotions getting the best of him while he plays a position that calls for poise and maturity. "We forget that he was thrust into a situation in 2016 that not any catcher ever had to endure," Cubs catching coach Mike Borzello said. "Showing up late in the season, being asked to catch what turned out to be a world championship pitching staff ... Once that happened, I think the assumption was, 'He's here. He's polished. He's ready to go.'" It certainly looked that way. Playing with boundless energy, Contreras ranked fourth in OPS among catchers that season, including a .972 mark against fastballs. By 2018, that number plummeted to .682 off fastballs, which included a .192 batting average. The dip versus off-speed pitches was similar, and Contreras lost much of his power. He hit 11 fewer home runs (10 overall) in 2018 than the season before, in about 100 more at-bats. His offense simply fell apart. But why? Borzello has a theory. "He put so much focus on his defense, it may have had an effect on his offense," he said. "You never hear that. It's always the other way around. In my opinion, it did last year." Borzello could be onto something for one simple reason. A catcher used to be judged on his arm and, secondarily, perhaps on his blocking ability. But in today's game, pitch framing seems to be cited more often than caught stealing percentages when assessing a catcher. Contreras shouldn't be concerned with the latter stat, considering he has a cannon for an arm, but stealing a strike or two for his pitchers hasn't been his forte. The Cubs know he's well aware of it and think it has been on his mind too much. "He knows that's a category that's analyzed a lot," Borzello said. "Maybe the most. We're constantly trying things to get better." Like a lot of Contreras' game after his rookie season, his pitch framing has dropped to the bottom of the league. In 2017, he ranked 49th out of 54 catchers (minimum 50 games). Last season, he ranked 45th out of 51. Perhaps improving there will spill over to his offense, as Contreras is committed to being better. He even sought advice from his younger brother, a catcher in the Braves organization. "I used to stick my glove out all the way," Contreras said. "Now I'm going to show the target, but I'm going to quarter-turn it a little bit. That way my hand gets relaxed, and I have a rhythm behind the plate. I was too stiff. He talked about that, and he was right." Borzello echoed that notion, pointing out the Cubs have been trying to get Contreras to alter his style slightly since he came up. "It gives you some sort of rhythm," Borzello said. "Instead of catching from a dead standstill, you have some sort of movement and rhythm to the ball. It also frees up your hand on your left side. So it gives you some freedom there as well." It's such a subtle move -- his pitchers haven't even noticed it -- but they've noticed a more committed-than-ever catcher. "He told me he was working on something real small," Kyle Hendricks said. "I haven't really noticed it. ... [He's] determined. Renewed focus. He's always locked in and brings the energy every day." There's little doubt that Contreras' energy helped vault him to the majors as a converted infielder back in 2016. He is a fist-waving, loud player when he's involved in tense moments -- and that has served him well. But there are drawbacks. Some scouts who have watched his career believe that actually has held him back. He hasn't always had a loving relationship with umpires, either. If there is a correlation between energy and running the bases, that has worked against Contreras instead of for him. According to FanGraphs, he has been among the Cubs' three worst baserunners every year of his career. He was second-worst on the team in 2018, with a minus-5 in the FanGraphs baserunning metric (which translates somewhere between poor and awful). But the new year has brought a new attitude. Borzello says he's seeing changes already this spring. "Controlling his personality, effort level and all that stuff has improved," Borzello said. "We've seen it in this camp so far. Now we have to see it when the lights go on." 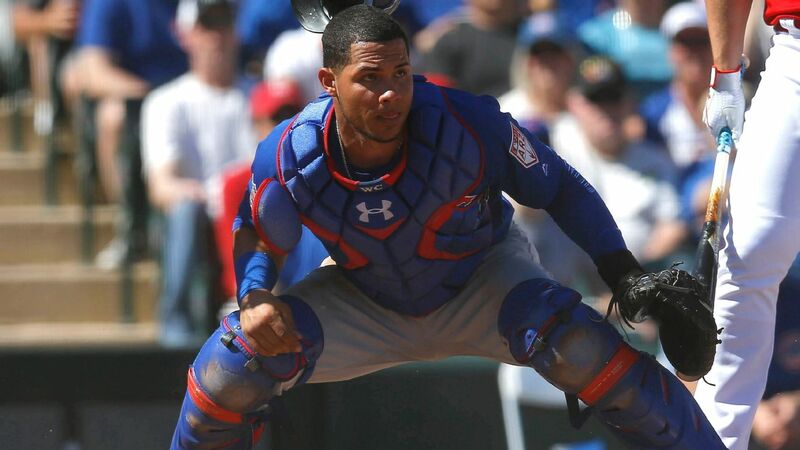 As Contreras attempts to separate his offense from his defense, and vice versa, everyone knows that the quickest way for a player to gain confidence is a hot start at the plate. Stats don't matter in March, but good habits do. Contreras' Cactus League batting average (currently .389) and two home runs will be quickly forgotten next month, but the Cubs are hoping the changes to his approach will stick. "I've been watching him close," manager Joe Maddon said. "What he's doing at the plate is not an accident. He's doing something differently, in a good way. "I think it's sustainable, whether it's spring training or not. That's my impression. Now I want to see it against 93, 94 or 95 miles per hour." It sounds like Maddon is aware of the precipitous drop in production Contreras has experienced against fastballs and knows that one of the changes he's making might address it. Again, it's a subtle move but potentially a big one. "Last year I was late on a lot of pitches," Contreras said. "It was just timing. I was loading late, and I'm putting hard work on it. So far it seems like I'm getting on it." An earlier load in the batter's box, a quarter-turn of his mitt on defense, a quieter, more controlled presence -- they're all part of a remake the Cubs hope will pay big dividends for their catcher in 2019. Ask a Cubs fan who the X factor is on the roster, and Contreras will be at the top of the list. "I like to hear that," Contreras said. "I like to read it. I'm working my best to get back to 2017." The comeback has begun. There are several Cubs whose turnarounds could have huge impacts, but as much as people talk about Yu Darvish, he affects one game out of every five. Contreras has a hand in everything, nearly every day. "A top-of-the-line catcher is such gravy to a contending team," an NL scout said. "Most of the time, you just want them to catch a good game. Any more than that, it can be huge." Maddon's focus is not on the subtle changes to Contreras' offense or defense. It's about his demeanor and his confidence. The talent is there. It just has to be harnessed. "He's a confidence guy," Maddon said. "The big thing with him is to act like he's done it before and he's going to do it again." Can he do it? Will a quieter version of Contreras be able to maintain the things that make him who he is? As the T-shirt says, don't believe him, just watch. "There's a lot of people that doubted me because of last year," Contreras said. "I'm going to be quiet."